What: Publisher of book and movie reviews weekly at Dead End Follies. 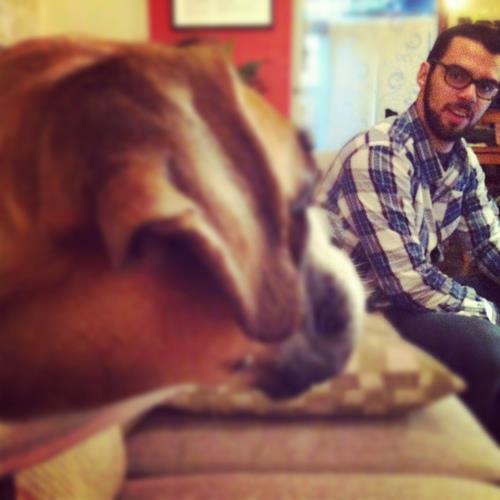 He lives with his better half Josie and his senior citizen boxer dog Scarlett. He loves writing, watching basketball and obsessing over things. Interview conducted by email. Some questions and answers have been edited. Congrats on another successful year at Dead End Follies. How old is your site now? How have things evolved since you first launched? Thank you! Dead End Follies is turning eight this year. The site underwent major technical changes last year: I migrated it to Squarespace, hooked it up to Google Analytics, and developed a search engine-friendly content strategy. It was the first major change since I decided to dedicate it entirely to book and movie reviews in 2011. In terms of evolution, Dead End Follies first found a purpose—smart and accessible criticism—and now it’s finding its audience, which is exciting. I believe the most important milestone in Dead End Follies’ evolution happened in 2016: I understood who I was writing for—who I wanted to write for and have a relationship with. Readers. People passionate about genre literature. When you start a book reviewing venture and the publishing industry is starting to take interest in you, it’s validating. You start getting free books in the mail, you discover new voices. That’s great, but it’s easy to get caught in that and start perceiving querying authors as clients. I want to help people reappropriate an intellectual relationship to their entertainment. Dead End Follies has a purpose and a mission now. We’re a far cry from the desperate outlet for my chaotic thoughts on culture that I created in 2009 when I was working in a call center. This entry was tagged #amreading, #amwriting, #qanda, Benoît Lelièvre, book review, book reviews, Dan Schwent, Dead End Follies, Gabino Iglesias, George Cotronis, Joe Clifford, Jordan Harper, Joseph Haeger, Keith Rawson, Kemper Boyd, Laird Barron, Miranda Koryluk, movie review, movie reviews, Richard Vialet. Bookmark the permalink.